Missourian John Lewis Barkley was awarded the Congressional Medal of Honor for actions he took Oct. 7, 1918. This image of him is from a painting done by Howard Chandler Christy in 1930. It’s likely you’ve never heard of John Lewis Barkley. 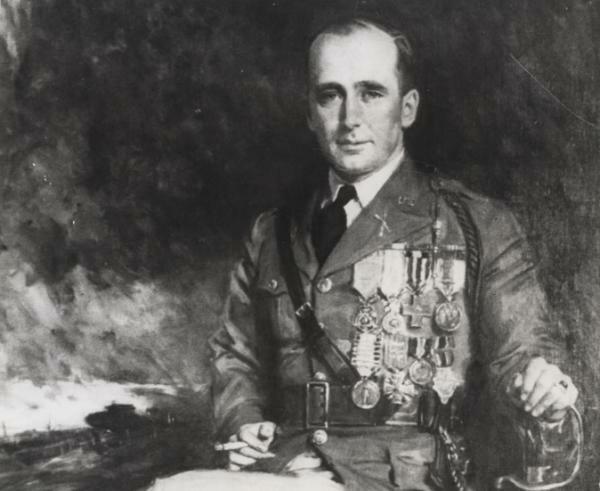 The Missouri native fought in World War I, winning the Congressional Medal of Honor and later writing a book about his experience. Yet his book, “No Hard Feelings!” and his name remain in relative obscurity, even as the nation marks the 100th anniversary of World War I’s end. That surprises Steven Trout, who helped get the book reprinted under the title “Scarlet Fields” in 2014. “I’m astonished, in fact, and I don’t really know the reason,” he told St. Louis Public Radio. Trout is an English professor at the University of South Alabama who specializes in war literature. He first learned of Barkley during visits to the National World War I Museum and Memorial in Kansas City. The museum’s director asked Trout whether he’d read Barkley’s book. John Lewis Barkley was one of the most decorated soldiers in World War I, but both he and his memoir "No Hard Feelings!" remained in relative obscurity. Barkley was born in 1895 and grew up on a farm near Holden in west central Missouri. He prided himself on being a woodsman and claimed to be a descendant of Daniel Boone. While he knew how to handle a gun, Barkley had a bad stammer that made it difficult to pass the Army’s medical examination, even after the U.S. entered the war. Once he was accepted to the military, his officers soon recognized his skills. “He could hunt. He could trap. He was an excellent shot. So when he was sent to Camp Funston in 1917 the Army realized here was someone that could do this kind of intelligence work,” Trout said. Barkley would do dangerous reconnaissance work in wartime France; scouting ahead of American troops, observing the enemy and reporting back, as well as serving as a sniper. He excelled in the role. His actions on Oct. 7, 1918 made him one of the most decorated soldiers of World War I. That afternoon, he was sent ahead of the American lines near Cunel, France, to try to learn where the German force was located. Shortly after, his telephone wire back to camp was cut and Barkley saw German soldiers advancing. He quickly spotted a German machine gun nest and an abandoned French tank. He grabbed a light machine gun, as much ammunition as he could carry and took cover in the tank. “Probably to the tune of an hour and a half to two hours, he fended off a German force of several hundred enemy soldiers and did this single-handedly from this tank,” Trout said. 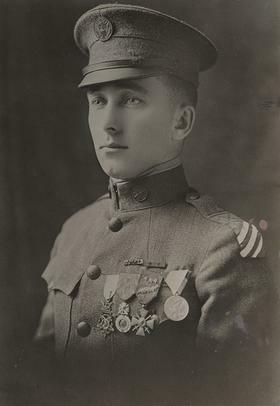 Barkley would win the Congressional Medal of Honor, along with five medals for bravery from other Allied nations. After the war Barkley returned to the farm in Missouri. But the bottom fell out of the agriculture economy and Barkley soon was looking for a way to support his widowed mother and himself. He decided to capitalize on the wave of books about what was then known as the Great War. Barkley would send notes to a military friend, Mike Mulcahy, who wrote the manuscript. After being turned down by several publishers the Cosmopolitan Book House in New York took on the project and had five editors fine tune the book. Barkley was unapologetic about his wartime exploits and his recollections of the Great War were at odds with the time. The book would barely sell. Barkley had wanted to name it “Scarlet Fields,” but the editors used an anecdote in the book to name it "No Hard Feelings," instead. Today, a century after the war’s end, Trout said Barkley’s memoir provides a unique view of a World War I American intelligence platoon. Despite the fact that Barkley had a lot of help in telling his story, the story is truly his. Trout said for a while, Barkley worked for a detective agency in Kansas City, but it didn’t last. Eventually, he met and married Marguerite Mullen, who had grown up on a large dairy farm in Johnson County, Kansas, southwest of Kansas City. The Mullen family owned quite a bit of land in an area that would become a city suburb. Barkley worked as a park supervisor in Johnson County. “He had a real passion for public parks and believed very strongly that people needed to experience the great outdoors and get out and have the kinds of experiences he had as a boy in Missouri,” Trout said. A park building and roadway in the Johnson County park system are named after Barkley. He died in 1966 at the age of 70. With poetry, red poppies and praise for peace, Kansas City on Veterans Day remembered soldiers from all wars as it commemorated the centennial anniversary of the armistice that ended World War I. Of the 40 million people who died in World War I, only 441 were from around Kansas City. With so few casualties from this area, how did the national museum and memorial for this war end up here? Mike Vietti, the museum's marketing director, hears this question a lot. "This really was, in many respects, a crowdsourced National Museum and Memorial," Vietti says. To understand why Kansas City was up to that challenge requires remembering what the city was like a hundred years ago.